Here are some of your not so serious responses. I have seen a stoned wallaby but I don't know about them making crop circles. The one I saw was slurring his words and asking me for a dollar as he was trying to get the boat to see his brother in New Zealand - he looked in no mood to be formulating a series of complex agricultural design patterns. I could be wrong - they might have masterminded the twin tower attacks, who really knows? This has to be the funniest headline of the year so far. Trippy Skippy. My cat Monkey, a Tonkinese cat, started to walk in circles mysteriously about two months ago. My suspicion is the radar from the two police cars parked in front of my apartment building has an effect or sonar like sound that humans cannot hear may have an effect. I was struck by this news article and had to respond. I resent this report that we are high as a kite and making crop circles! I haven't been stoned since 1971. A few young hoppers eat the wrong plant and you trash our species in the news. What's this world coming to! I saw a whole bunch of them dingos going mad in my corn field only last night. I'm not sure if they were high or not but I'm pretty sure they were. One of them had a ghettoblaster and they were listening to some kind of fast electronic music. Lock 'em up and throw away the key, that's what I say! I was travelling in Tasmania in the summer of last year and witnessed what I believed as dancing wallabies. I was intoxicated at the time and so put it down to the poppies I had consumed earlier that day. However after reading this article that experience made a lot of sense. Bumped into a couple o' stoned wallabies coming out the co-op up Lochgelly high street the other night. This seems to be a problem on both sides of the globe. I've lived in Tasmania for many years. Not only do wallabies congregate in poppy fields, but also on the local golf courses. They do this mainly at night and I can only assume they're playing several rounds of golf while avoiding greens fees. You only need to be really worried when one of the stoned wallabies gets into a golf buggy. I want to know who sold out the wallabies? Who's the narc? My guess is the platypus, he is such an odd duck. Don't know about crop circles but I saw one today trying to jack a car, presumably trying to get enough together for his next fix. The question should be whether or not those law breaking wallabies should be brought to justice for indulging in illegal substances. The law makes no exceptions for no-one no matter what their excuse is or even what species they may be. 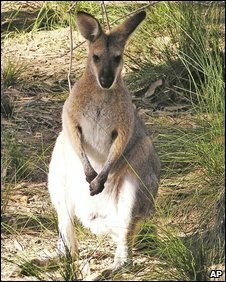 They are not setting an example for their joeys nor for any other marsupials and I fear this could become an epidemic of outback size proportions.